Outputs analog voltage as per UV radation falling on it. Easy to interface with any MCU with ADC. 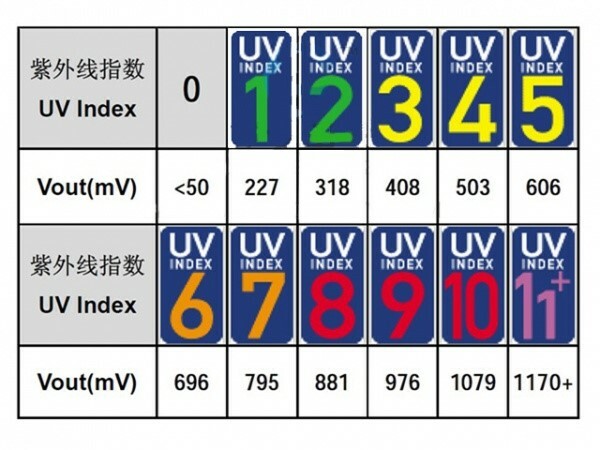 The UV Sensor is used for detecting the intensity of incident ultraviolet(UV) radiation like UV radation in sunlight. This form of electromagnetic radiation has shorter wavelengths than visible radiation. This module is based on the sensor GUVA-S12SD and SGM8521 Opamp, which has a wide spectral range of 200nm-370nm. The module outputs calibrated analog output voltage which varies with the UV intensity. Suitable for measuring the total amount of ultraviolet sunlight intensity or other light radation source. The UV Sensor module is based on the renowned sensor GUVA-S12SD from EOC (www.eocinc.com) . GUVA-S12SD is a Gallium Nitride material based Schottky-type photodiode, optimized for photovoltaic mode operation. Next main component is an Op-Amp IC SGM8521 from SGMICRO (www.sg-micro.com). The SGM8521 is a rail-to-rail input and output voltage feedback amplifiers offering low cost. This Op-Amp have a wide input common-mode voltage range and output voltage swing, and take the minimum operating supply voltage down to 2.1V and the maximum recommended supply voltage is 5.5V. Besides, SGM8521 provides 150kHz bandwidth at a low current consumption of 4.7 µA. Here is the basic circuit diagram of the UV Sensor Module, In the circuit PD1 is the GUVA-S12SD, and U1 is the SGM8521. Rx is 10M.